Just as remotely-operated vehicles help humans explore the depths of the ocean from above, NASA has begun studying how a similar approach may one day help astronauts explore other worlds. 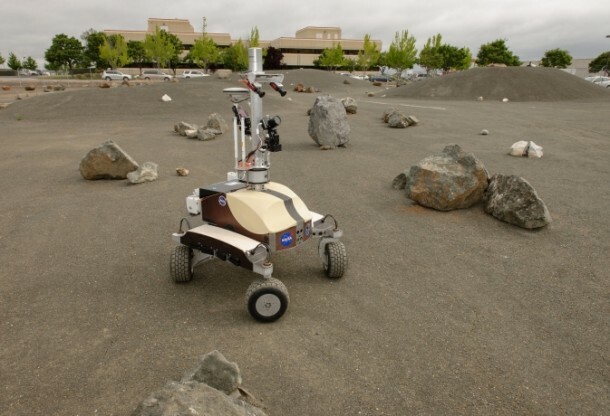 On June 17 and July 26, NASA tested the Surface Telerobotics exploration concept, in which an astronaut in an orbiting spacecraft remotely operates a robot on a planetary surface. In the future, astronauts orbiting other planetary bodies, such as Mars, asteroids or the moon, could use this approach to perform work on the surface using robotic avatars. During the June 17 test, Expedition 36 Flight Engineer Chris Cassidy of NASA remotely operated the K10 planetary rover in the Roverscape – an outdoor robotic test area the size of two football fields located at NASA Ames – hundreds of miles below on Earth’s surface from his post aboard the International Space Station (ISS). For more than three hours, Cassidy used the robot to perform a survey of the Roverscape’s rocky, lunar-like terrain. The July 26 test picked up where Cassidy left off. Fellow Expedition 36 Flight Engineer Luca Parmitano of the European Space Agency remotely-controlled the rover and began deploying a simulated Kapton film-based radio antenna. These tests represent the first time NASA’s open-source Robot Application Programming Interface Delegate (RAPID) robot data messaging system was used to control a robot from space. RAPID originally was developed by NASA’s Human-Robotic Systems project and is a set of software data structures and routines that simplify the process of communicating information between different robots and their command and control systems. RAPID has been used with a wide variety of systems including rovers, walking robots, free-flying robots and robotic cranes. The test also is the first time the NASA Ensemble-based software — jointly developed at Ames and NASA’s Jet Propulsion Laboratory in Pasadena, Calif. — was used in space for telerobotics. Ensemble is an open architecture for the development, integration and deployment of mission operations software. Fundamentally, it is an adaptation of the Eclipse Rich Client Platform (RCP), a widespread, stable and supported framework for component-based application development. Since 2004, the Ensemble project has supported the development of mission operations software for NASA’s Science and Human Exploration and Operations mission directorates. 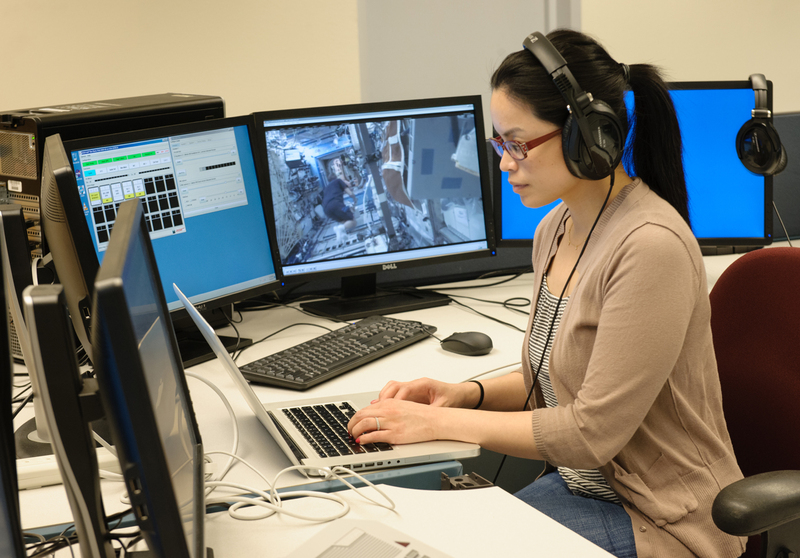 The primary objective of the Surface Telerobotics testing is to collect engineering data from astronauts aboard the space station, the K10 robot and data communication links. This will allow engineers to characterize the system and validate previous ground tests. NASA will conduct a final test session with the space station in August. During this test, engineers and an astronaut will inspect the deployed antenna and study human-robot interaction. The primary goal of the Human Exploration Telerobotics project is to understand how human and robot activities, such as Surface Telerobotics, can be coordinated to improve crew safety, enhance science activities and increase mission success while also reducing cost, risk and consumables, such as fuel and oxygen, during future exploration missions. The K10 robot is a four-wheel drive, four-wheel steer robot that stands about 4.5 feet tall, weighs about 220 pounds and can travel about three feet per second (a little slower than the average person’s walking pace). For the Surface Telerobotics tests, K10 is equipped with multiple cameras and a 3-D scanning laser system to perform survey work, as well as a mechanism to deploy the simulated radio antenna. This year’s Surface Telerobotics tests simulate a possible future mission involving astronauts aboard NASA’s Orion spacecraft traveling to the L2 Earth-moon Lagrange point. The L2 point is where the combined gravity of the Earth and moon allows a spacecraft to easily maintain a stationary orbit and is located 40,000 miles above the far side of the moon. From L2, astronauts would remotely operate a robot to perform surface science work, such as deploying a radio telescope. This mission concept was developed by the Lunar University Network for Astrophysics Research (LUNAR), which is based at the University of Colorado, Boulder (CU). Students from several universities assisted with the development of Surface Telerobotics. Industrial design students from the Academy of Art University in San Francisco collaborated with NASA engineers to create the user interface for remotely operating the K10 rover. Undergraduates from CU and the University of Idaho helped design the Kapton film deployer, which is mounted on K10.